Light emitted across a continuous range of wavelengths. 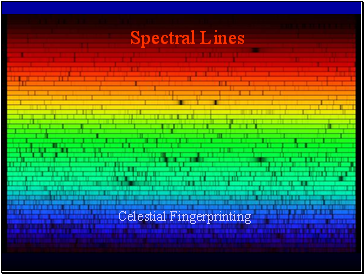 A thermal spectrum is a continuum spectrum. 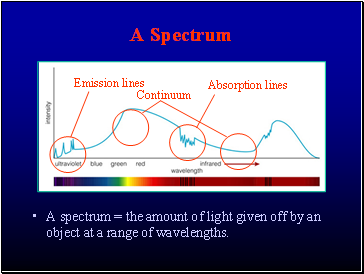 A spectrum = the amount of light given off by an object at a range of wavelengths. The sun shines on a cold airless asteroid made of black coal. What light from the asteroid do we detect? Some reflected visible, plus emitted visible light. Some reflected visible, plus emitted infrared light. 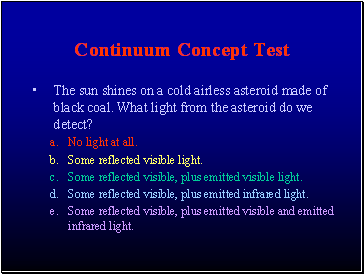 Some reflected visible, plus emitted visible and emitted infrared light. 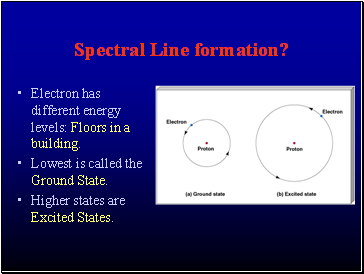 Electron has different energy levels: Floors in a building. Lowest is called the Ground State. Higher states are Excited States. 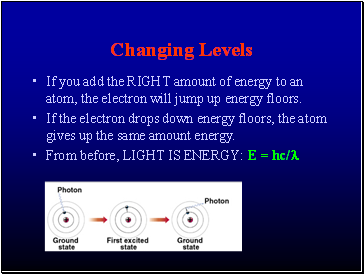 If you add the RIGHT amount of energy to an atom, the electron will jump up energy floors. If the electron drops down energy floors, the atom gives up the same amount energy. Light of all wavelengths shines on an atom. 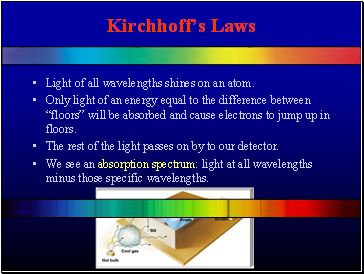 Only light of an energy equal to the difference between “floors” will be absorbed and cause electrons to jump up in floors. The rest of the light passes on by to our detector. 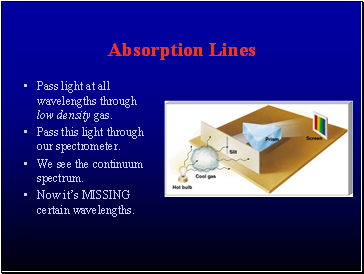 We see an absorption spectrum: light at all wavelengths minus those specific wavelengths. Pass light at all wavelengths through low density gas. 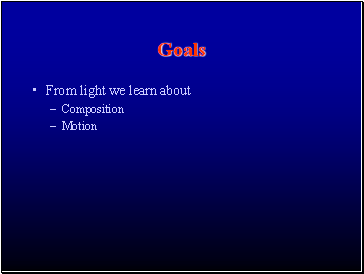 Pass this light through our spectrometer. 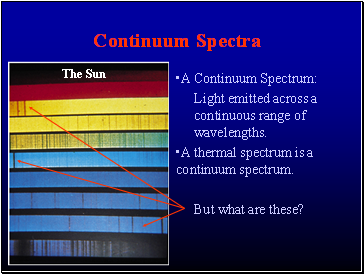 We see the continuum spectrum. Now it’s MISSING certain wavelengths. 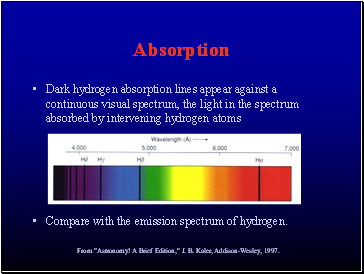 Compare with the emission spectrum of hydrogen.